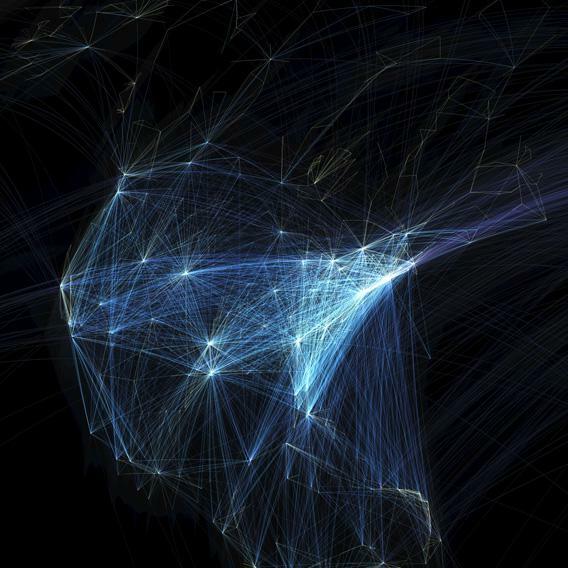 World flight path map: Busiest airports are Atlanta, Frankfurt, Sao Paolo, Beijing. 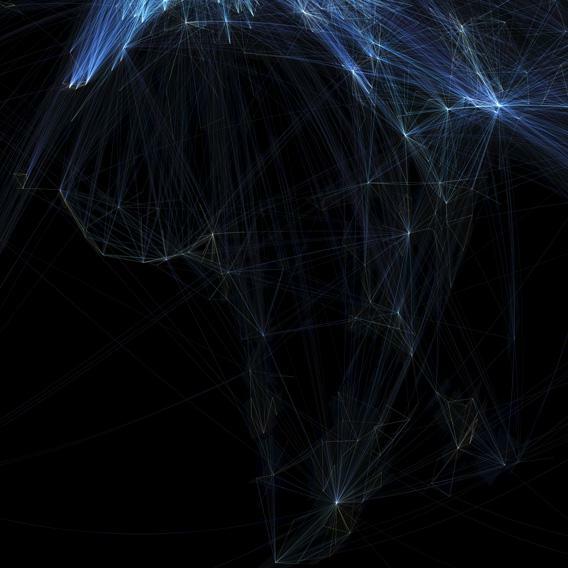 This global flight map traces the city-to-city routes of some 58,000 flights, with dim blue lines for long, individual routes and brighter spots where short flights overlap and intersect. 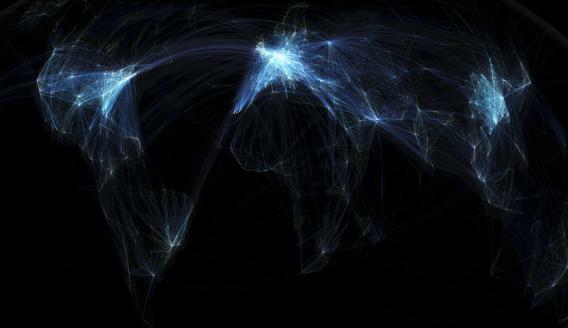 The United States and China may be the world’s biggest economic engines, but on this gorgeous map of the world’s flight paths, Europe glows brighter than either one. The map, designed by a young Canadian GIS consultant named Michael Markieta, traces some 60,000 routes on major and regional airlines around the globe. 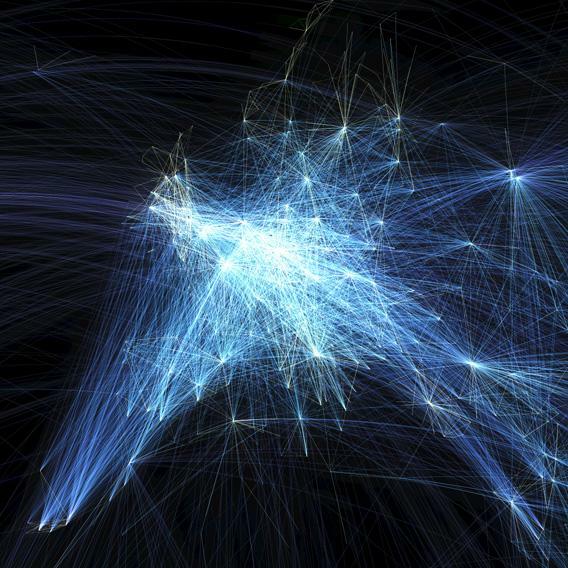 The flight paths aren’t precise, but the departure and destination cities are. Marketa’s map shows shows relatively faint blue lines for each individual route and bright white nodes where multiple routes intersect or overlap. One of the things that leaps out at first glance is the plethora of connections in the Eastern United States, East Asia, and most of all Europe, which makes sense given those regions’ wealth and population density. Europe has the greatest concentration of short-hop flights. Germany’s Frankfurt International Airport is the busiest destination on the map, with 235 direct flights. By contrast, almost the entire Southern Hemisphere is dim, save for a few bright spots in cities such as Sao Paolo and Syndey. The relative brightness of vacation spots like the Canary Islands compared to nearby African countries like Morocco highlights the persistent economic disparities in air travel patterns. Africa remains poorly served by airlines, with Spain’s Canary Islands appearing brighter than major African cities on the map. Nonetheless you can roughly trace the continent’s outlines by the flights between coastal population centers. The busiest U.S. airport is Atlanta, but the Washington-New York-Boston corridor appears to be the most heavily traveled overall. A 2009 Brookings study found that the busiest city pairs were New York-Miami and Los Angeles-San Francisco. Atlanta is home to the busiest U.S. airport, though the densest concentration of flights is along the Atlantic seaboard. Perhaps the most fascinating thing about the map is that there’s no “base layer” tracing the outlines of countries or continents. Instead, the flight routes themselves sketch the edges of the world’s major land masses, because so many people live in and travel between coastal cities. Markieta, who works for the global engineering and design firm Arup,* has answered questions about the map on Twitter and Reddit, and he explains his methodology in depth in this blog post. *This post has been updated to note that Markieta works for Arup.